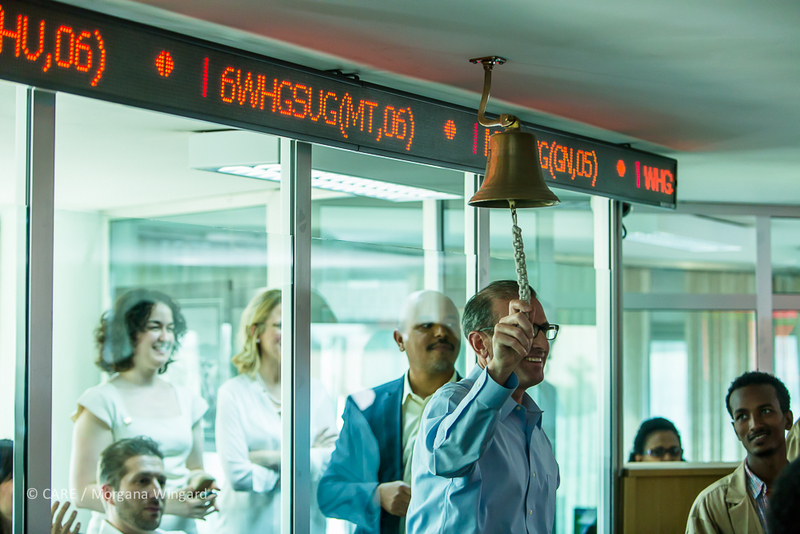 Addis Ababa, Ethiopia - Jan 23, 2014: Rob Lehman, Chief of Staff for Senator Rob Portman (OH) rings the bell for the Ethiopia Commodity Exchange trading floor. Addis Ababa, Ethiopia - Jan 23, 2014: Ethiopia Commodity Exchange (ECX) is a private commodities company that was established in 2008. As of November 2010, the trading floor in Addis Ababa, handled 200 contracts in commodities. Addis Ababa, Ethiopia - Jan 23, 2014: Operating during regular business hours, the ECX trading floor holds various sessions for transacting different commodity contracts. Trades are made in the pits by bidding or offering a price and quantity of contracts, depending on the intention to buy (bid) or sell (offer). Addis Ababa, Ethiopia - Jan 23, 2014: If a trader wants to buy ten contracts of grade 1 of Jimma A, at a price of three hundred, for example, on the floor he would yell " Jimma A1 at three hundred,” stating grade before price, and turn his palm inward toward his face. If the trader wants to sell the same, he will yell the same quote, and show one hand with the palm facing outward. The combination of hand-signals and vocal representation between the way a trader expresses bids and offers is a protection against misinterpretation by other market participants. Addis Ababa, Ethiopia - Jan 23, 2014: Kojo Nnamdi of The Kojo Show interviews ECX Chief Technical Adviser, Solomon Edossa, at their headquarters in Addis Ababa. Awassa, Ethiopia - Jan 22, 2014: As of July 2011, ECX consists of 55 warehouses in 17 regional locations. It has grown from trading 138,000 tons in its first year to over 508,000 tons a year, with nearly equal shares of coffee, oilseeds and pulses. Awassa, Ethiopia - Jan 22, 2014: Trucks filled with bags of coffee are waiting in this compound to be inspected. A sample from every bag will be tasted to grade the quality before it is accepted into the warehouse. 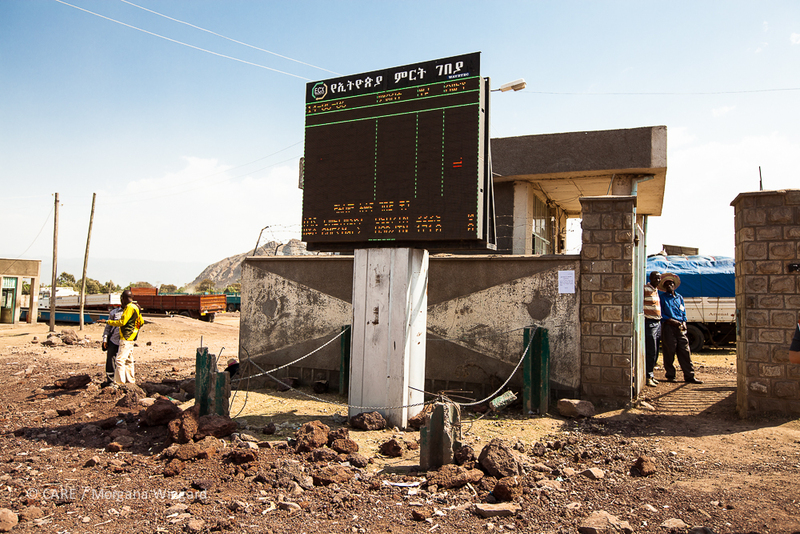 Awassa, Ethiopia - Jan 22, 2014: Before, farmers didn't know the price of their commodity across the country. They often didn't know how much they could sell for until they arrived at the market. Now, price quotes are transmitted in real time on outdoor electronic ticker boards in 32 rural sites, on the ECX website, to 256,000 mobile subscribers via instant messaging, and over the radio, TV and print media. Awassa, Ethiopia - Jan 22, 2014: ECX warehouses issue an Electronic Goods Received Note and provide the depositor with a signed print copy. The Electronic Goods Received Notes are not negotiable, not transferable and represent legal title to the deposited commodity. Depositors have to receive an Electronic Warehouse Receipt before they are able to trade their commodity on the trading floor. Awassa, Ethiopia - Jan 22, 2014: ECX has an integrated and complex warehouse system. Commodities are deposited in warehouses operated by ECX in major regions of the country. At the ECX warehouse, commodities are sampled, weighed and graded using state-of-the-art technology grading and weighing equipment. Awassa, Ethiopia - Jan 22, 2014: Commodities are deposited in warehouses operated by ECX in major regions of the country. At the ECX warehouse, commodities are sampled, weighed and graded using state-of-the-art technology grading and weighing equipment. As a native Seattlite, the birth place of Starbucks, I love my coffee. Recently, I had the opportunity to see first hand the origins of world renowned Ethiopian coffee and how strategic agriculture initiatives in Ethiopia are improving food security in the region. I was photographing for CARE on a trip with policy makers and a production team from The Kojo Nnamdi show to learn a little about food aid reform and the giant efforts of the U.S. government in collaboration with the Ethiopian government. As a photographer, I typically see the story -- looking for light and scenes that can tell the tale in a single image. This time I was in for a treat. Watching and talking to Kayla and Michael of the Kojo show, I learned to open my ears and hear the story. Now, I'll never be as good as they are at discovering and capturing the intricate sounds of coffee sipping and trading floor bells, but it sure is fun to have amazing audio to compliment my photos. I can't tell you how many times I wish I had a recorder to capture something a speaker said that I knew I'd forget before I could write it down. Listen to the links below to hear about the photos above and how U.S. investments and the Ethiopian government are increasing food security in the region through business and trade.